On this date in 1796, Republican France subdued the troublesome Vendee with the execution of its last great rebel. 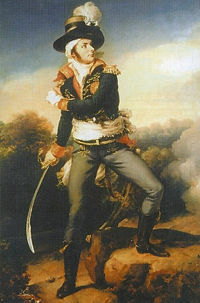 Royalist officer Charette (English Wikipedia link | French) had assumed leadership of the anti-Republican revolt that broke out in the Vendee in 1796 — albeit with some turf rivalry with other anti-Republican figures in the area. After a capable stretch of guerrilla campaigning, Charette had no sooner laid down his arms than the desperately counterrevolutionary English pushed for an ill-considered resumption of hostilities. This time, the rebels took it in the culottes. Charette, having upheld the monarchist cause long past his fellows — and much past any hope of success — became the figure the Republic had to eliminate to pacify the region. As English historian Archibald Alison has it, Charette paid a grim price for refusing to just be bought off. This indomitable chief, however, could not long withstand the immense bodies which were now directed against him. His band was gradually reduced from seven hundred to fifty, and at last, ten followers. With this handful of heroes he long kept at bay the Republican forces; but at length, pursued on every side, and tracked out like a wild beast by bloodhounds, he was seized after a furious combat, and brought, bleeding and mutilated, but unsubdued, to the Republican headquarters. … Maltreated by the brutal soldiery, dragged along, yet dripping with blood from his wounds, before the populace of the town, weakened by loss of blood, he had need of all his strength of mind to sustain his courage; but, even in this extremity, his firmness never deserted him. 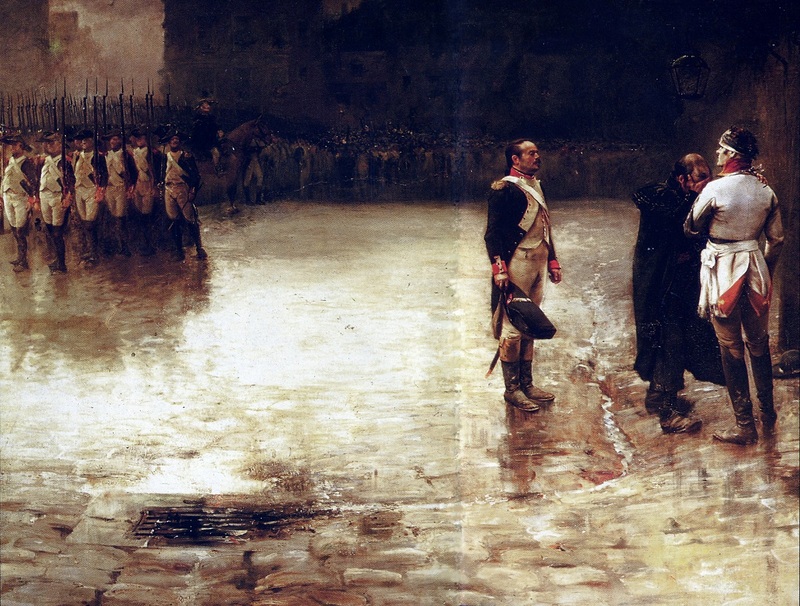 He was shot in Nantes after a perfunctory trial, refusing a blindfold and giving the orders to his own firing squad. 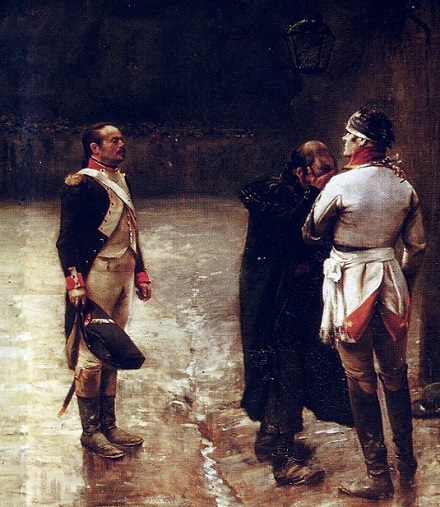 The execution of Charette. Mid-19th century illustration. 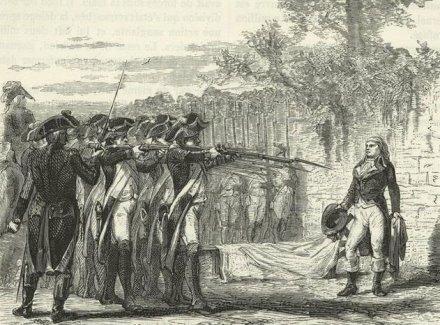 Execution of General Charette, in Nantes, March 1796, by Julien Le Blant. Napoleon, who had done well to duck a possibly career-killing assignment to the Vendee the year before and was in consequence at this very moment the Revolution’s emergent man on horseback,* paid tribute from his suitable distance to Charette’s brilliance. Charette was a great character; the true hero of that interesting period of our Revolution, which, if it presents great misfortunes, has at least not injured our glory. He left on me the impression of real grandeur of mind; the traces of no common energy and audacity, the sparks of genius, are apparent in his actions. * Having made his name by efficiently putting down a royalist putsch in Paris a few months before, Napoleon had wed Josephine just three weeks before Charette’s execution. i wonder if my strong christian bielef is driven by the thought that i may be related to Francois Charette? If so how do i find out? There you have the explanation for his continued resistance against the terror of the republic. Yes, what the republican government had ordered to be executed on the Vendée was officially called “La Terreur”. You may read the new book “La guerre de la Vendée et le system de dépopulation.” It explains in details the ‘ethnic cleansing’ of the Vendèe – before the term was invented. The republicans were given orders to “…exterminate this rebellious race of Vendéeans, to make their abodes disappear, to torch their forests, to cut their crops.” The first to be targeted were the priests and these were soon followed by men, women and children of all walks of life. An estimated 250,000 out of a regional population of just 800,000 were massacred.